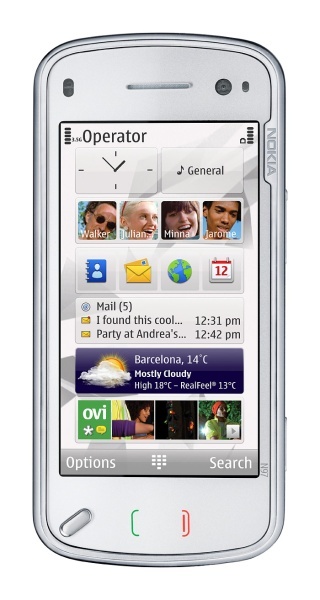 Nokia today announced the launch of the Nokia N97. It is the first touch-enabled Nseries device and has a horizontal tilt-slide form factor. It transforms from a touch slate to a landscape QWERTY device. The device, which has an Internet and entertainment focus, runs on S60 5th Edition, has a customisable, widget-based, home screen and full support for Ovi services. It features a 3.5 inch (360 x 640 resolution) touchscreen with haptic feedback, 5 megapixel camera (with Carl Zeiss optics and dual LED flash), A-GPS and compass sensors, comprehensive connectivity options (WiFi, tri-band HSDPA, Bluetooth and USB), and 32GB of internal flash memory. Read on for more. The N97 is the most feature packed Nseries device to date and, by adding touch, it moves Nokia's high end Nseries into direct competition with touch devices such as the Samsung Omnia, LG Renoir, Apple iPhone and G1 Android Phone. Here are first few hand-ons impressions: In the hand the N97 feels pleasingly solid, with an extremely impressive slide mechanism - it is obvious a lot of testing has gone into the hinge mechanism. In slide closed mode it is equally solid, with no give. The keyboard, while limited by design constraints, feels good, though as ever it's difficult to come to any final conclusions with prototypes. Subjectively, the 'feel' and the design of the handset screams high end with materials that can not be fully appreciated in pictures (it has that caress-ability x-factor). It is a relatively large device, especially length-wise, but that's inevitable given the size of the screen and the inclusion of a QWERTY keyboard. There's the usual plethora of hardware features, including sensors (accelerometer, compass sensors and proximity sensors), integrated A-GPS, and connectivity options (tri-band 3G, WiFi, Bluetooth and USB). The large screen is a definite highlight - its widescreen 16:9 resolution is ideal for watching videos, but also works well for browsing the Internet. The touch screen is very sensitive, and there have been further refinements to the home screen to enable easier finger touch usage (the larger physical screen also helps with this). The UI can also be driven from the keypad using the D-pad on the left hand side of the keyboard, together with the on-screen softkeys and home key. 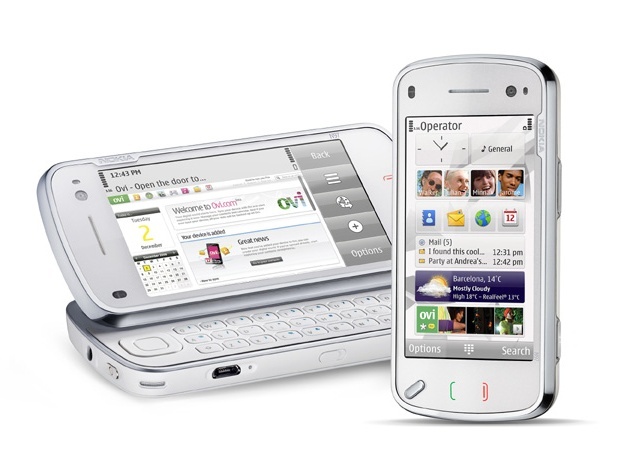 S60 5th Edition has been updated to Nseries specifications for the N97. Extras include UPnP, Internet Radio and Nokia Photos applications and we can expect to see a lot more in this area before the phone is released. We'll report in greater detail in due course. Runs S60 5th Edition. You can read more about S60 5th Edition in our Nokia 5800 preview. However, the N97 will have the Nseries version of S60, which means there will be a number of extra applications including Internet Radio, FM transmitter, Home media (UPnP) and Photos. The home screen can be personalised with Internet-aware widgets (based on WRT technology). Examples included in the press photos include weather forecasts, social networking (Facebook, Friendster, My Space) status summaries, and media collections. There are also indicators for time, profiles, email, application shortcuts and so on. Text input is via on screen keyboard (full screen QWERTY, pop-up QWERTY and alphanumeric), as is standard on S60 5th Edition, or handwriting recognition or via the QWERTY keyboard. Fully compatible with Ovi services including Maps, Music, Share and Games. Nokia Music store can be accessed from the device (touch optimised version) or from Nokia Music for the PC (an iTunes -Windows application). Nokia Maps now supports high resolution satellite imagery, 3D buildings (selected buildings) and richer map meta data. Pedestrian route finding and turn by turn, voice guided car navigation, are available as premium services. Internet focus with WebKit based browser, comprehensive RSS feed support and runtime technologies including Flash, WRT (widget). Introduces the social location (So-Lo) concept; the N97 has software that allows you to automatically update and share your location with friends and popular social networks. 'N-Gage compatible' device, which indicates that the N-Gage platform will be touch enabled by the release date of the N97. The devices being demoed at Nokia World are running an early version of the software. In the six months leading up to the release date it is likely to evolve considerably. Physical dimensions: 117.2 x 55.3 x 15.9 mm (18.25 mm at camera area), and weighs approximately 150g. Tilt form factor with horizontal slide to reveal full QWERTY keyboard. The upper half of the device slides away from the bottom half and moves upwards in a diagonal direction. The slide is impressively smooth and when closed feels very solid in the hand (so much so its not immediately apparent it is a horizontal slide device). There are three keys on the front of the device: send and end keys and a home/menu key. On the left side of the device there is a slider lock and a microUSB port, on the top of the device is the power and 3.5mm audio jack and on the right hand side are the volume keys and the camera capture key. 3.5 inch, 360 x 640 (nHD) resolution resistive touch TFT screen with 16 million colours. The device can be driven using finger touch or stylus, or from the QWERTY keyboard. Haptic feedback for screen touches. This is provided via general vibra feedback, as on the Nokia 5800. 5 megapixel camera with Carl Zeiss optics and dual LED flash. The camera is covered by a sliding lens cover similar to that found on the N85 and N79. The camera is also used to record videos at VGA at 30 frames per seconds, but I've seen a demo of it recording and playing video back in a 16:9 resolution mode (also as on the 5800). The usual Share online application is present for uploading images and video to online services such as Flickr and Share on Ovi (available services likely to be expanded before launch). Integrated A-GPS and compass sensor (magnetometer) means that the N97 'intuitively knows where it is' and this is used by Nokia Maps, and for social location; also embeds location information into images and video. 3.5 mm audio jack (also used for TV-Out) and built in stereo speakers. Music playback time of one and half days (36 hours). There's also an FM radio and FM transmitter. WiFi, 3.5G (tri-band HSDPA - 900, 1900 and 2100 Mhz), quad-band GSM and Bluetooth connectivity (various profiles including HID, SAP, A2DP and AVRCP). 1500 mAh battery (BP-4L - the same monster as that used in the E71, E90, 6650 and N800). There is no stylus built into the phone, but one will be included in the box. The Nokia N97 is expected to ship in the first half of 2009 (presumably in June) with an estimated price of 550 Euro before taxes and subsidies. 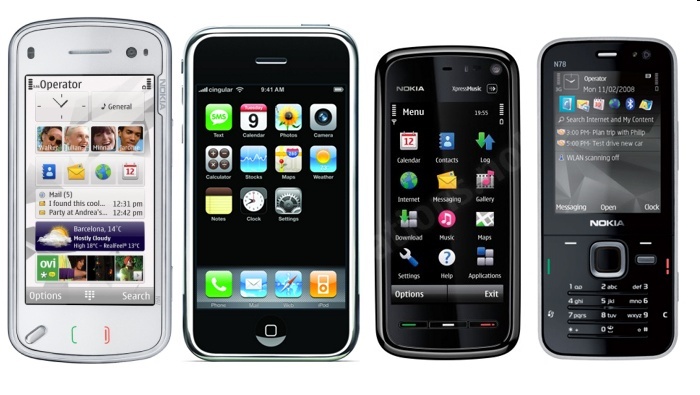 The N97 (117.2 x 55.3 x 15.9 mm) is larger than the 5800 (111 x 51.7 x 15.5 mm). Compared to the iPhone (112 x 56.9 x 12.5 mm) is a little taller, but slightly mm narrower. Quite impressive given the incluion of a QWERTY keyboard. N78 also shown. “From the desktop to the laptop and now to your pocket, the Nokia N97 is the most powerful, multi-sensory mobile computer in existence,” said Jonas Geust, Vice President, heading Nokia Nseries. “Together with the Ovi services announced today, the Nokia N97 mobile computer adjusts to the world around us, helping stay connected to the people and things that matter most. 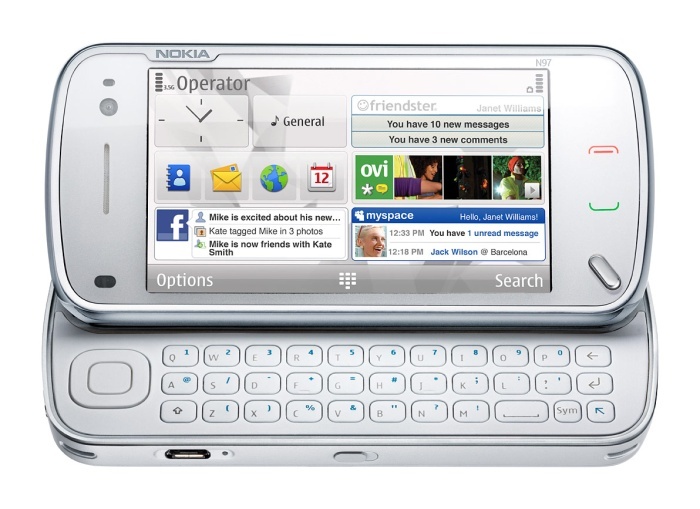 With the Nokia N97, Nseries leads the charge in helping to transform the Internet into your Internet”.